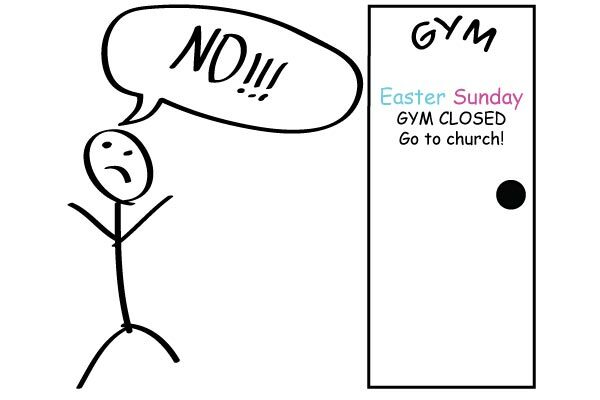 Thou shalt keep the Sabbath day holy, and not work out. Even the creator of the universe took a day off, so you should too! And make that day Sunday, after all it’s supposed to be a day of rest. Thou shalt drink a lot of water – Hydration is key to building muscle. If your body is dehydrated then you will experience weakness and fatigue. Thou shalt always use clamps – Don’t be the guy who tries to use the preacher curl bar with out putting clamps on. It’s not just for your safety but anyone else walking by could lose a toe due to your over-confidence in balancing those weights while doing curls. Thou shalt leave thy baby at home – Don’t bring your infant to the gym even if they are strapped into a seat. The gym is dangerous; a small accident while lifting could cost your child’s life. Thou shalt have a spotter – Don’t try to be a hero and max out with out a spotter. One slip of the wrist and you could have a broken neck or worse. Thou shalt clean thy sweat – If you sweat or leave grease spots on the equipment then wipe that stuff off, it’s curtious gym etiquette. There are usually spray bottles and paper towels at any gym for this purpose. Remember cleanliness is next to Godliness. Thou shalt always wash thy hands – If you use the bathroom then wash your hands. Hundreds of people touch all the weight that your filthy hands were on. Additionally, don’t cough or sneeze into your hands but rather into your shoulder. It will help reduce the spreading of germs. Thou shalt eat sparingly – If eat less calories than your burn then you will lose weight. And for you people trying to pack on mass, the opposite is true. Pre-workout drinks and creatine do no good if you are not eating enough food. Thou shalt go to bed early – 80% of your bodybuiling is done at night in your sleep. The other 20% is done at the gym. Sleep is important and if you don’t get any then you won’t get stronger. Thou shalt not park thy truck on the side walk – Don’t be a tool and park your truck right in front of the entrance to the gym. We get it, your truck is cool but use the parking lot like every other decent person. This entry was posted in Bodybuilding, Workout Routine and tagged gym etiquette by Russell Jensen. Bookmark the permalink. Very funny article, but also so true! “Thou shalt clean thy sweat” – hahaha, if everyone would respect this command, going to the gym would be so much more enjoyable!